Unlike many other entry-level satellite speaker systems, the HKTS 15 is built for high performance. All five speakers use the same driver material to provide a smooth, consistent sound field that sounds incredibly realistic and natural. Each satellite is a 2-way design, featuring a 3/4" metal-dome tweeter. The metal-dome tweeter is strong but lightweight, allowing it to reproduce high frequencies with detail, accuracy and clarity. Joining the tweeter is a 3-1/2" midrange driver, which delivers increased mid-bass response and smooth vocals. No high-performance home theater would be complete without a powered subwoofer. To deliver deep, substantial bass, the HKTS 15 uses a rigid 10" woofer powered by a powerful 100-watt amplifier. The woofer’s rigid design allows it to move, while still hold its shape without bending or distorting. This results in high excursion with minimal distortion, and a home theater experience that you just don’t hear but feel. Whether you’re doing it yourself or a professional is doing it for you, the HKTS 15 is easy to wire. High-quality speaker connections on the back of each speaker allow for the use of “better” speaker wire. 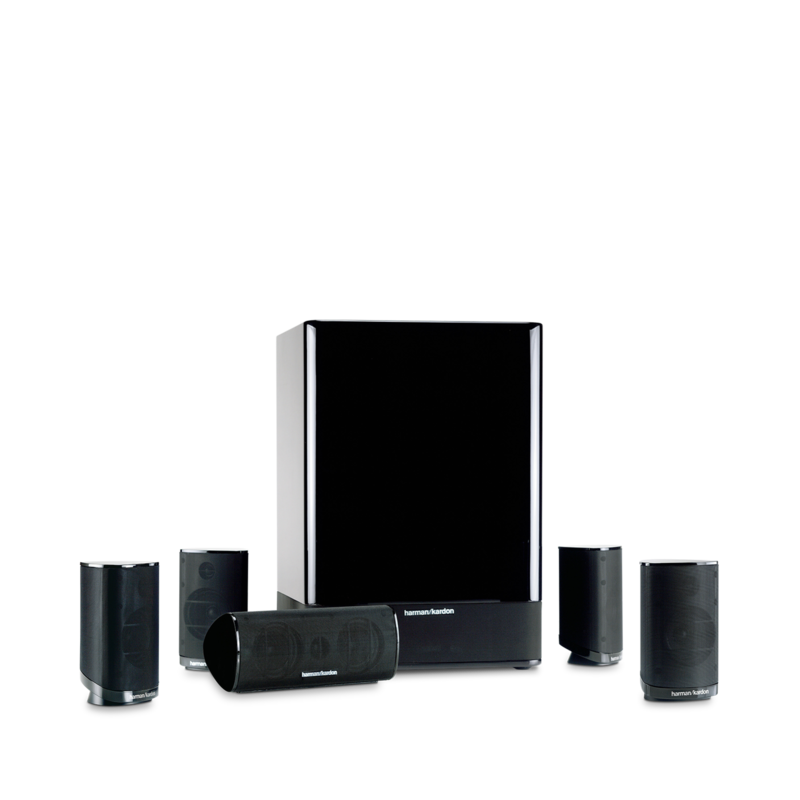 The powered subwoofer includes both a line-level (LFE) connection (for today’s 5.1 and 7.1 surround receivers), and speaker-level connections for use with older receivers or stereo receivers. The HKTS 15’s LFE input even has an “audio sense” circuit to turn itself off automatically when not in use. If you’re using the included wall brackets, they attach effortlessly to the bottom of each satellite, and even allow rotation so you can precisely dial in the best speaker placement. Featuring an eye-catching high-gloss-black finish and a sleek design, the HKTS 15 would be a stunning centerpiece of any home theater system based on looks alone. But the HKTS 15 sounds even better than it looks. Using advanced speaker technology and featuring a powered subwoofer that will rattle your walls, the HKTS 15 will deliver an exciting and realistic theater experience in most moderate-sized rooms. It’s the perfect system for stepping up your home theater experience from your television’s speakers or a typical home theater in a box. And have you just taken the Blu-ray plunge? If so, the HKTS 15 delivers an incredible sound experience from today’s latest high-definition sources like Blu-ray. And the HKTS 15 can integrate into nearly any décor. All the hardware for bracketing the speakers on the wall is included. Don’t want to hang the speakers on your wall? Optional black speaker stands are available (HTFS 2); they blend into the satellite speakers for a sleek, seamless look. The HKTS 15 even gives you the ability to build toward an affordable 7.1 home theater. Add another pair of the optional satellite speakers (HKS 6), and that 7.1-channel home theater is just a step away.